The Battle of Shiloh was fought April 6-7, 1862, and was an early engagement of the Civil War (1861-1865). Advancing into Tennessee, Major General Ulysses S. Grant's troops were attacked by the Confederate Army of Mississippi. Taken by surprise, Union forces were driven back towards the Tennessee River. Able to hold, Grant was reinforced during the night of April 6/7 and launched a massive counterattack in the morning. This drove the Confederates from the field and secured a victory for the Union. The bloodiest battle of the war to date, the losses at Shiloh stunned the public but were far lower than the battles that would come later in the conflict. In the wake of the Union victories at Forts Henry and Donelson in February 1862, Major General Ulysses S. Grant pressed up the Tennessee River with the Army of West Tennessee. Halting at Pittsburg Landing, Grant was under orders to link up with Major General Don Carlos Buell's Army of the Ohio for a thrust against the Memphis and Charleston Railroad. Not expecting a Confederate attack, Grant ordered his men to bivouac and commenced a regimen of training and drill. While the bulk of the army remained at Pittsburg Landing, Grant dispatched Major General Lew Wallace's division several miles north to Stoney Lonesome. Unbeknownst to Grant, his Confederate opposite number, General Albert Sidney Johnston had concentrated his department's forces at Corinth, MS. Intending to attack the Union camp, Johnston's Army of Mississippi departed Corinth on April 3 and encamped three miles from Grant's men. Planning to move forward the next day, Johnston was forced to delay the attack forty-eight hours. This delay led his second-in-command, General P.G.T. Beauregard, to advocate cancelling the operation as he believed the element of surprise had been lost. Not to be deterred, Johnston led his men out of camp early on April 6. Johnston's plan called for the weight of the assault to strike the Union left with the goal of separating it from the Tennessee River and driving Grant's army north and west into the swamps of Snake and Owl Creeks. Around 5:15 AM, the Confederates encountered a Union patrol and the fighting began. Surging forward, the corps of Major Generals Braxton Bragg and William Hardee formed a single, long battle line and struck the unprepared Union camps. As they advanced, units became entangled and difficult to control. Meeting with success, the attack drove into the camps as the Union troops attempted to rally. 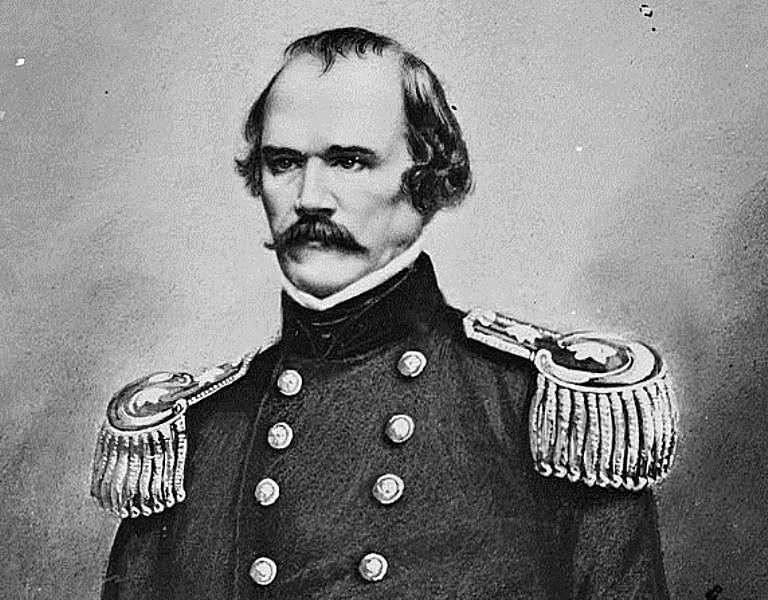 Around 7:30, Beauregard, who had been instructed to remain in the rear, sent forward the corps of Major General Leonidas Polk and Brigadier General John C. Breckinridge. Grant, who was downstream at Savannah, TN when the battle began, raced back and reached the field around 8:30. Bearing the brunt of the initial Confederate attack was Brigadier General William T. Sherman's division which anchored the Union right. Though forced back, he worked tirelessly to rally his men and mounted a strong defense. To his left, Major General John A. McClernand's division was also forced to stubbornly give ground. Around 9:00, as Grant was recalling Wallace's division and attempting to hasten the lead division of Buell's army, troops from Brigadier Generals W.H.L. Wallace's and Benjamin Prentiss' division occupied a strong defensive position in an oak thicket dubbed the Hornet's Nest. Fighting valiantly, they repulsed several Confederate attacks as Union troops on either side were forced back. The Hornet's Nest held for seven hours and only fell when fifty Confederate guns were brought to bear. Around 2:30 PM, the Confederate command structure was badly shaken when Johnston was mortally wounded in the leg. Ascending to command, Beauregard continued to push his men forward and Colonel David Stuart's brigade achieved a breakthrough on the Union left along the river. Pausing to reform his men, Stuart failed to exploit the gap and moved his men towards the fighting at the Hornet's Nest. With the collapse of the Hornet's Nest, Grant formed a strong position extending west from the river and north up the River Road with Sherman on the right, McClernand in the center, and the remnants of Wallace and Brigadier General Stephen Hurlbut's division on the left. Attacking this new Union line, Beauregard had little success and his men were beaten back by heavy fire and naval gunfire support. With dusk approaching, he elected to retire for the night with the goal of returning to the offensive in the morning. Between 6:30-7:00 PM, Lew Wallace's division finally arrived after an unnecessarily circuitous march. While Wallace's men joined the Union line on the right, Buell's army began arriving and reinforced his left. Realizing that he now possessed a sizable numerical advantage, Grant planned a massive counterattack for the next morning. Advancing at dawn, Lew Wallace's men opened the attack around 7:00 AM. Pushing south, Grant and Buell's troops drove the Confederates back as Beauregard worked to stabilize his lines. Hampered by the previous day's intermingling of units, he was not able to form his entire army until around 10:00 AM. Pushing forward, Buell's men retook the Hornet's Nest by late morning but met strong counterattacks by Breckinridge's men. Grinding on, Grant was able to retake his old camps around noon, forcing Beauregard to launch a series of attacks to protect access to the roads leading back to Corinth. By 2:00 PM, Beauregard realized that the battle was lost and began ordering his troops to retreat south. Breckinridge's men moved into a covering position, while Confederate artillery was massed near Shiloh Church to protect the withdrawal. By 5:00 PM, most of Beauregard's men had departed the field. With dusk approaching and his men exhausted, Grant elected not to pursue. The bloodiest battle of the war to date, Shiloh cost the Union 1,754 killed, 8,408 wounded, and 2,885 captured/missing. The Confederates lost 1,728 killed (including Johnston), 8,012 wounded, 959 captured/missing. A stunning victory, Grant was initially vilified for being taken by surprise, while Buell and Sherman were hailed as saviors. Pressured to remove Grant, President Abraham Lincoln famously replied, "I can't spare this man; he fights." When the smoke of battle cleared, Grant was praised for his cool demeanor in saving the army from disaster. Regardless, he was temporarily relegated to a supporting role when Major General Henry Halleck, Grant's immediate superior, took direct command for an advance against Corinth. Grant regained his army that summer when Halleck was promoted to general-in-chief of the Union armies. With Johnston's death, command of the Army of Mississippi was given to Bragg who would lead it in the battles of Perryville, Stones River, Chickamauga, and Chattanooga.